The Arms were matriculated by warrant of the Lord Lyon King of Arms in the Public Register of All Arms and Bearings in Scotland on the 12th day of June, 1950. They must therefore not be displayed, copied or reproduced in any way without proper authority. 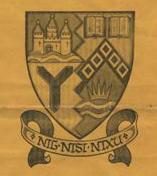 Dexter chief: (from the Arms of the County of Ayr) The Castle represents Ayrshire. Dexter base: (also from the Arms of the County of Ayr) The Shakefork represents the Cunningham district Of Ayrshire. Sinister base: A device in accordance with one well-known explanation of the name Dalry to represent “the King’s Valley”. The black chevron with the five silver muscles is an allusion of the ancient family of Blair. Sinister chief: The open books represent study or knowledge. In short the badge represents, reading anti-clockwise, Ayrshire, Cunningham, Dalry, the School.